Road paviours prepare the surface, lay pavements (e.g., roads, paths, sidewalks) and finish the pavement. Determine, depending on the local soil conditions, the amount of base materials needed and supply the materials. Remove old sidewalk or existing soil and excavate to the proper depth. Bring the surface to the proper height by adding sand. Apply edge restraints, gutters, gulleys and drains, and connect these to the sewer. Determine the paver layout pattern and create markings, e.g. for joints and stringlines. Cut paving stones to size, e.g. using a masonry saw or a grinding machine. Set pavers with different techniques and tools (e.g. hand and power tools). 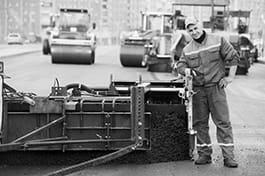 Tamp the entire paving surface in both directions until surface is smooth, for example using a mechanical plate tamper. Sweep sand into the joints until they are full. Confer with client or supervisor after job completion prior to opening to traffic.